There are "bad" fats, which include trans fats that are found in foods like french fries and donuts. And then there are "good" fats. These are Fatty Acids—Omega-3, Omega-6 and Omega-9—that are important for metabolic and cellular health. The American Heart Association recommends at least two servings of oily fish per week, but Omega-3 Fatty Acids are often in short supply in our diets. 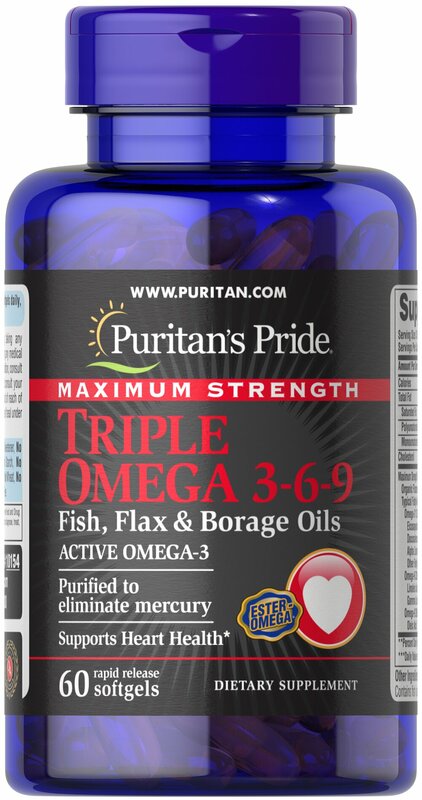 Puritan's Pride Triple Omega can help supplement your diet. They are purified to eliminate mercury. No Artificial Color, Flavor or Sweetener, No Preservatives, No Sugar, No Starch, No Milk, No Lactose, No Gluten, No Wheat, No Yeast, No Shellfish. Sodium Free.